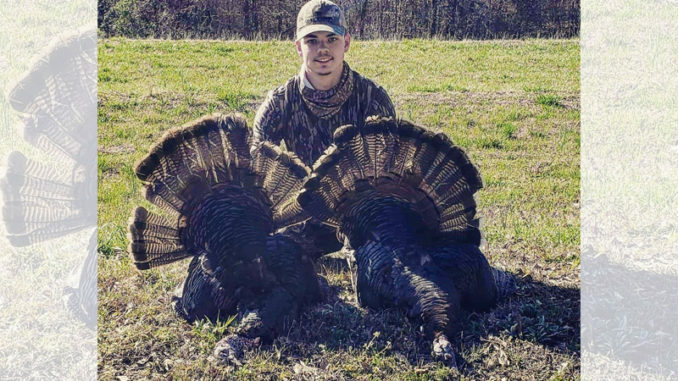 Jerred Martin of Goucher, S.C. dropped both of these birds on March 20, 2019 in Cherokee County. Twenty-one-year-old Jerred Martin of Goucher, S.C. has been a deer and duck hunting fanatic since he was a kid. Last year, he added turkey hunting to his list of outdoor hobbies when his brother James Martin got him involved. And on opening day of this season, he killed his first gobbler. A few minutes later, he killed his second turkey. James was doing the calling, making the Cherokee County hunt extra special. 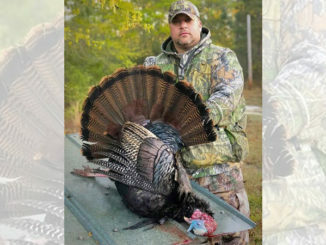 The hunt started on March 19, the evening before South Carolina’s opening day, when the two brothers did some scouting and observed a group of turkeys heading to roost. “We’d been watching several groups of turkeys for about two weeks and had a good idea of where to find some. We went out that evening and roosted some birds, and we made a game plan for the next morning,” said Martin. And on opening morning, the two hunters set up about 150 yards from where they knew those birds were roosting. They could see the turkeys on the roost and watched them fly down. “We got in there really early — about 45 minutes before daylight. We kept things simple and didn’t have any decoys. When it got time, my brother did a little calling and the turkeys answered him right away. Not long after that, a group of hens flew down and started heading in our direction. Then four males came strutting in behind them,” he said. When the biggest gobbler got within 25 yards, Martin pulled the trigger on his JEBS choke tube-equipped Remington 12-gauge 870 Super Magnum. The bird dropped. Instead of running off, one of the smaller male turkeys, a jake, pounced on the downed gobbler. Martin let that one have it too, capping off a great opening day with one bird for the supper table and another for the freezer. The gobbler had a 6-inch beard and 3/4-inch spurs. “It was a great experience having my brother call for me, and me getting two turkeys on the same hunt. He got me involved in turkey hunting last year. It meant a lot to me for us to experience that hunt together,” said Martin. South Carolina’s private land turkey hunting season opened on March 20, and the WMA lands opened today, April 1 (no Sunday hunting allowed on WMAs). The season runs through May 5. North Carolina’s turkey hunting season opens this weekend for youth hunters. Those 18-years-old and under have it all to themselves through April 12. Then the statewide season opens to adult hunters too starting on April 13 and running through May 11.